What’s better than new Minecraft skins? 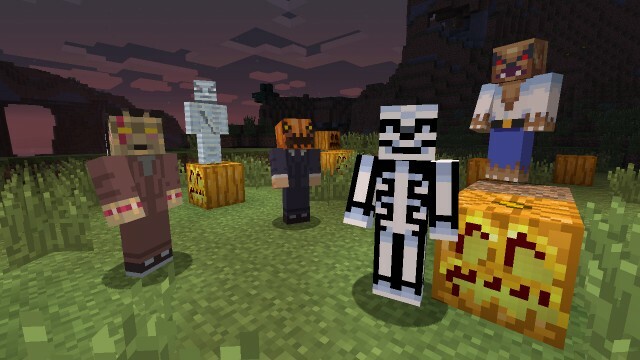 Halloween-themed Minecraft skins, of course. Oh, better than that? Halloween-themed Minecraft skins for charity? No? Halloween-themed Minecraft skins for FOUR charities? That’s exactly what’s on the table in this, the final week, of Crafting for a Cause — the Minecraft: Xbox 360 Edition event where all proceeds of the limited edition Halloween Skin Pack go directly to charity. Our friends over at PlayXBLA want you to know that Microsoft, 4J Studios and Mojang have selected four great causes, to which they’ll donate the full 160 MSP ($2) value of every pack sold. In an amazing show of support, the Minecraft: Xbox 360 Edition community has already purchased over $700,000 worth of the Halloween Skin Pack in the three short weeks this event has been running, but there’s still time to donate/get-your-hands-on-these-exclusive-skins. Each skin was handcrafted by the hardworking folks at some of the best development studios around, including: 343 Industries, Twisted Pixel, The Behemoth, Climax Studios, Rare, Tequila Works, Mojang and 4J Studios themselves. In order to whet your appetite, XBLA Fans has lovingly compiled all 55 skins into easy to digest, alphabetically ordered slides for you to peruse at your leisure. Hit the jump for the goods. If even one of these great skins catches your eye, please consider purchasing the pack for 160 MSP before it’s too late! Crafting for a cause will continue to collect contributions until Monday, November 26. You really can make a difference!